The Apple-1 is the very first product from the minds of Steve Jobs and Steve Wozniak, and when one of the 50 or so boards known to still exist sells at auction it’s a big deal. These fragile pieces of computing history regularly fetch upwards of $300,000. Jimmy Grewal recently acquired one such board (the board would have been the heart of a computer you’d build yourself) in a private sale through Christie’s, seller anonymous, and original owner unknown. He’s been covering his restoration of the board on Twitter. The board itself wasn’t listed on Apple-1 expert Mike Willegal’s registry, making it a rare find indeed, and one Grewal had been looking to acquire for some time. “I have been collecting vintage Apple computers since the mid/late 90’s when I was a student at Duke ... though I got my first Apple in 1983 [a 1979 Apple II+] when I was in the first grade,” Grewal wrote to Gizmodo in an email. His connection with Apple goes even deeper. Before moving to Dubai and starting his own company—Elcome—he was Microsoft’s project manager on Internet Explorer for Mac. 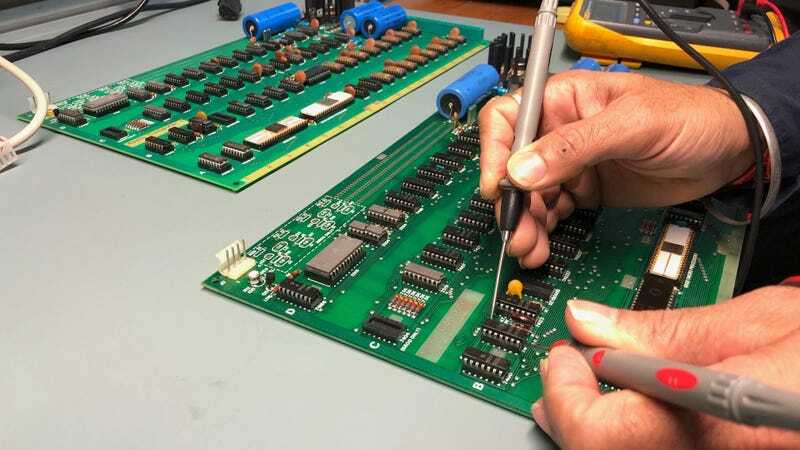 Though a self-described “software guy” Grewal has an ace in the hole for what might otherwise be a difficult and delicate restoration: he manages a company with a circuit board repair division. “The team there helped me assemble an Apple-1 replica last year on the off chance that I ever got my hands on an original...that effort has paid off now as we have the knowledge, tools, and most importantly experience to tackle restoring something this rare and valuable.” While the first step remains basic cleaning, and he only received the board this weekend, skills gained from that dry run will already come to bear. While Apple-1s often fetch hundreds of thousands of dollas, Grewal had the chance to buy one from a former Apple employee back in 1999 while living in San Fransisco. “She wanted $25k and I had a fraction of that to spare being fresh out of college. I instead invested what money I had in AAPL [stock]. I sold some of those shares to buy this Apple-1 primarily to “complete” my collection,” Grewal wrote. Financially, it seems he’s made the better choice, though his collection hasn’t suffered for it. A portion of his collection. Starting at the top left and going clockwise: Twentieth Anniversary Macintosh, original iMac G3, G4 Cube, G3 iBook, Powerbook 100, and Macintosh Portable.